Welcome to U-DO Brewery Inc. Here at U-DO Brewery Inc., we are using a cutting-edge technique producing a natural high end HGW (High Gravity Wort) beer kit in 12 different styles which includes our first Season-Ale “The Irish Red Kentucky Honey Bourbon Ale” (more styles to come) for the home brewer available through your local retail U-Brew store. What’s unique about U-DO Brewery is all our HGW 15L beer kits are brewed to the 1516 Purity Law (Reinheitsgebot); malt, hops, yeast and water with no additives, no preservatives and no adjuncts. Whether you are just starting out or an advanced brewer, you will find our kits a great platform with easy to follow instructions, or modify and tailor these kits to your own style and liking. Our kits are a great and easy way to get an excellent pure tasting beer at an affordable price. Visit our Advanced Brewing Techniques tab for helpful brewing tips or your local U-Brew rep is always there to lend a hand. My name is Ryan Doray founder of U-DO Brewery Inc. and I believe everyone should experience the best tasting beer at a price you can afford. I’ve been in the brewing business for over 15 years and have had the pleasure to brew with great people at a company that pioneered and revolutionized the beer kit, only now what sets us apart, is I’ve developed and taken it up a notch to give you the first ever HGW 15L 1516 Purity Law microbrewery beer in a kit! All of us here at U-DO Brewery are excited to share this innovation with you, so go support your local retail U-Brew store and we’ll stay in touch … with exciting new styles and seasonals yet to come. The future looks bright and full of exceptional tasty beer! What’s in it? Kind of grains? Sugar? Water? Chemicals? Additives? Malted grains, specialty grains, hops, water and yeast. No adjuncts or additives, no sugars, no extract. The mixture of grains; principal base is Gambrinus pale 2 row barley. Specialty malts from Gambrinus, Briess, Country Malt Group and Hugh Baird. Made exactly like micro brewed beer but without very much water. Specific Gravity is around 1.075 after boiling. Irish moss is used as a processing aid. It’s just seaweed and helps clear the wort. In the kits there is the Safale s-04 from Fermentis which is a dry English ale yeast. Temperature range 12-25c (53-77F) Ideally 15-20c (59-68F). Dosage: 11.5g in 20-30 liters. Pitching: Sprinkle on to wort. Fermentis says the yeast is good for up to two years past the expiry date on the pack. How long do the kits last in the box and after fermentation? It’s been 9 months and they still have shelf life. Even though after six months the wort will darken slightly depending on the storage conditions, the darkening effect lightens up with fermentation; they don’t spoil and will make perfectly good beer. Every month or so we will make a kit up to recognize any changes or variables. Once a kit is made into beer it has the same shelf life as any microbrewery beer that follows the 1516 purity law. Not infected or oxidized, kept in a cool dark place it will last for at least a year and possibly longer. Any home-made beer improves significantly with age. Up to about three months it will get smoother as young flavours mellow out. How can I tell when it was packaged? The packaging date is clearly labeled on the front of the box. It reads the style of the beer and below it the date dd/mm/yy. What conditions should I store the unopened kit? Unopened kits should be handled much like finished beer; store cool, dark and dry. The box is thick and will keep out light however a cool basement is best. How good is the kit; better than cans of extract, or bulk malt, hops and grains? Is it a marketing scheme to make me buy pre-packaged beer kits? I wouldn’t have done 13 years with the Brewhouse and gone out to make a better kit if all the other methods were better or easier. If bulk malt extract, hops and grains were just as good, we would’ve simply packaged that for resale. U-DO kits are better. All is not good with malt in cans. Even if you get good quality malt, it can be stale. If it is fresh, it can be pretty good…except that it will be maillardized. Wort is made by vacuum concentration. During concentration sugar and flavor compounds undergo browning. This browning is called ‘The Maillard Process’. Same thing that happens to toast: it goes brown and changes flavor as heat is applied. All malt syrups are more or less browned in this way. Difficult to make a really light lager from extract-the extract is too dark to begin with. Won’t beer made with fresh malt extract, added grains, extra hops and careful attention be good? With the exception that it would be impossible to make beer as light in colour and flavor as our “The Lite” kit, yes, beer made that way can be very good indeed. So why use U-DO kits? While Homebrewer ‘A’ is still cracking his grains and warming his malt tins, Homebrewer ‘B’ is pitching his yeast and putting the lid on the fermenter. He’s finished. With U-DO kit’s you don’t have to sacrifice quality to save time. If I wanted the best quality, wouldn’t I be brewing from all grain? If you had the time. Typical all grain brewing day starts at 8am and ends around 6pm. You need a huge brewpot, burner (stove’s too small), & mash tun, lauter tun. Preferably brewing area has a floor drain and a hose for clean-up (very messy). 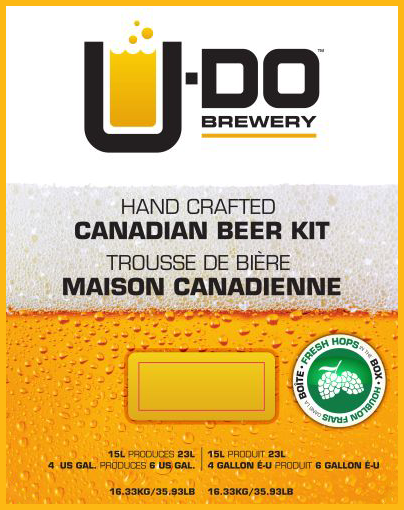 U-DO kit’s eliminates the mess, fuss and time, while making all-grain quality beer. How close are the U-DO kits to micro brewed and imported beers? Our rendering of the beer styles conforms to the definitions laid out by the authorities in the field: Michael Jackson and the AHA/BJCP guide. 1. The Lite: simple, crisp refreshing quality, great thirst quencher, even for people who don’t like beer. 2. The True Lager: All grain and subtle hop character make this a classic beer, perfect with seafood or all by itself. 4. The Pale Ale: Pure west coast with spicy Cascade hop flavor and aromas, this is the beer lovers beer. The beers taste like micro brewed equivalents-but only if those equivalents are well made. Is it really easy to mess up? What about fixing mistakes afterwards? Beginners will have most of the troubles with sanitizing. 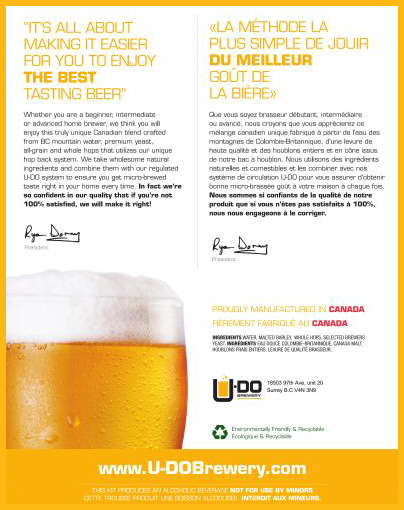 Talk with your local U-Brew Retailer or us here at U-DO for the correct way in sanitizing. Adding too much (or too little) water. Too little: just top up when you go to your carboy. Too much is harder: A liter or two discard on racking and treat it as a lesson. Several liters, you may add another U-DO kit of the same type and make a 46 liter batch, carefully measure the water to make up the kit. Fermentation not starting quickly: Handled improperly, the yeast rehydration results in slow or stuck fermentations. Not fermenting within two days, get another package of yeast and try again. Beer won’t clear in carboy/looks cloudy in bottle: Most important factor is time. A few extra days will probably clear it up. Cloudy in the bottle, first time brewers might not understand bottle conditioning. The kit will cloud up when you add the priming sugar (renewed yeast activity), will clear up, all within about ten days. Beer tastes ‘funny’: If it’s less than two weeks in the bottle, advise the customer to wait. If the beer is mature enough, make sure the customer is familiar with that style of beer. Check for bacterial infection. Like any homemade beer, the U-DO kitology is even more susceptible to spoilage because of the natural pure ingredients used. Can intermediate brewers add grains and more hops, or are they stuck with the beer as is? First thing brewers want to do is to customize their kits, trying to make their beer better and different. The U-DO kitology is the perfect vehicle for these aspirations. The new instructions will say to use chlorine or iodine based sanitizers. Why can’t I use sulphites? Sulphites are not strong enough for beer. Fine for wine, it has a low PH and a high alcohol content discourages spoilage organisms. Beer has a relatively high PH and low alcohol: needs more careful handling. Chlorine based sanitizers (unscented bleach, Diversol etc.) are excellent cleaning agents; however require a minimum 20 minutes contact time. Iodaphor works on contact (no soaking) with no rinsing. Breaks down very quickly: once the solution is made up, it must be used within 24 hours. After 24 hours it will have to be discarded and a fresh batch made. Hopefully this FAQ will answer some of the basics. Any questions relating to the development, makeup, use, & troubleshooting of the U-DO kitology can go through the technical department. Questions relating to sales, target markets, shelf presentation etc… can be handled by your friendly neighbourhood Sales and Marketing Department. If we didn’t answer all of your questions feel free to drop us a line any time.